There are 7 essential comma rules to learn. Learn when to use them, when not to use them, and how to avoid comma errors. Comma Rule #1: Use a comma after the penultimate item in a list of three or more items, before “and” or “or” (e.g. an Italian painter, sculptor, and architect). INCORRECT: Da Vinci was an Italian painter, sculptor and architect. CORRECT: Da Vinci was an Italian painter, sculptor, and architect. 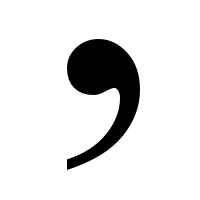 Comma Rule #2: Use a comma to separate a prepositional phrase from the main sentence. INCORRECT: In my office everyone has their own little cubicle. CORRECT: In my office, everyone has their own little cubicle.Prepositions: in, at, on, to, by, for, etc. Comma Rule #3: Use a comma to separate an adverb from the main sentence. INCORRECT: Suddenly a chill went down my spine. CORRECT: Suddenly, a chill went down my spine.Adverbs: suddenly, all of a sudden, silently, quickly, angrily, fortunately, unluckily, etc. Comma Rule #4: Use a comma after time clauses that introduce sentences. INCORRECT: After I got home I went straight to bed. CORRECT: After I got home, I went straight to bed.Time clauses: After I got home, when I saw her, once I realized the time, etc. Comma Rule #5: Use a comma after introductory phrases. INCORRECT: In the morning I go for a jog. CORRECT: In the morning, I go for a jog. Comma Rule #6: Use a comma to separate two independent clauses joined by a conjunction. CORRECT: The people on the boat were laughing, and the people on the beach were watching.Conjunctions: and, but, or, so. BE CAREFUL: Don’t put a comma before an “and” + verb without a subject. INCORRECT: The people on the boat laughed, and sang. CORRECT: The people on the boat laughed and sang. Comma Rule #7: Do not join two sentences with a comma. This is called a comma splice. INCORRECT: It was getting late, I was starting to panic. CORRECT: It was getting late, and I was starting to panic. CORRECT: It was getting late. I was starting to panic.